Huawei has announced its new flagship phone, the Mate 9, which is running Android 7.0 Nougat with Huawei's own EMUI 5.0 on top, powered by a 4000mAh battery and sports USB-C for fast charging, will be available for €699. Compare to P9, the Mate 9 also has a dual camera setup, but the new twin cameras - one sensor 12MP colour, the other a 20MP Leica-sourced black and white. What is worth mention, the Mate 9 has a 5.9-inch screen with 1920 x 1080 resolution display, and the minute black border around the screen is barely noticeable. With such a big HD screen, download and watch YouTube video on Huawei Mate 9 offline will be really wonderful. Here we will introduce you an easy and efficient way to free download YouTube videos for playback on Huawei Mate 9. Any Video Converter Freeware is a free powerful YouTube Video Downloader for Huawei Mate 9, with which you can download any YouTube videos, TV shows, MV for free in HD MP4 format. Please download and install this Free YouTube Video Downloader first for downloading and playing your favorite YouTube videos on Huawei Mate 9 offline. Step One: go to YouTube and search for the videos, movies you would like to free download, copy the video url link from those sites. Click on the Add URLs button, then a dialog will pop up, just click icon, and paste the download link to it. You can continue to paste more links as the previous steps. Tips: before downloading YouTube videos, press Online Video Tab, then simply choose Manually Select under Select Format thus you can choose the video format such as HD, MP4 etc. you need when downloading. 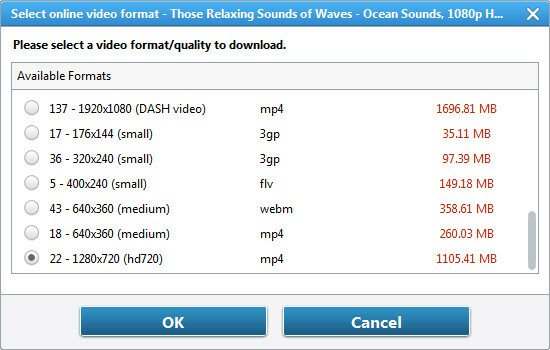 Step Two: after choosing the video format you prefer, press Start Download! button and click "OK" to start downloading those YouTube videos. After all of videos are downloaded to the computer. You can transfer the downloaded YouTube videos to Huawei Mate 9 for freely enjoying. Watching videos in Huawei Mate 9 is a fantastic experience. However, you might be tired of failing to play some movies on the phone due to the unsupported format. Don't worry, Any Video Converter Freeware will also help you solve this. In addition to download YouTube video for you, it supports to effortlessly convert any of your video files to many formats supported by Huawei Mate 9 for enjoying; the following is the detailed guide. Step 1. You can click “Add Videos” or “Add or Drag Files” to add the movies you want. Step 2. Click “Output Profile” drop down menu to select your desired output format. Step 3. Hit Convert Now button on the upper right corner of the program to start converting videos for Huawei Mate 9. Once conversion finished, you can transfer and play these converted movies on your Huawei Mate 9. Just download this free Huawei Mate 9 Video Converter and try it right now!